The sign on the way out of Durango said 'come back again and again' and given the memories of yesterday I'm sure many of us would like to. Like all Rally days though our sleepy reluctant departure was tempered with the thought of what lay ahead. And anyone with a guide book or a high school geography qualification knew that what we were about to witness was going to be epic. Out of Durango, and while not exactly straight as an arrow we headed west to Mancos over a high pine covered plateau. The morning light as sharp as anything we've seen so far. We touched on part of the old Spanish Historic Trail as we made our way along highway 160 to 'Historic Mancos where the west comes alive'. A retro' VW camper van with surfboard on the roof caught our eye, we liked their style but thought its a long way from the sea buddy. The landscape was changing, slowly but surely. Gone were the snowy peaks and the alpine switchbacks and in came the classic Western scrub with low gnarled trees and a more reddish brown desert appearance. On turning left to Hovenweep National Monument a signpost urged motorcycles to use caution as the road was 'curvy' ahead. That's fine, that’s what we came for! 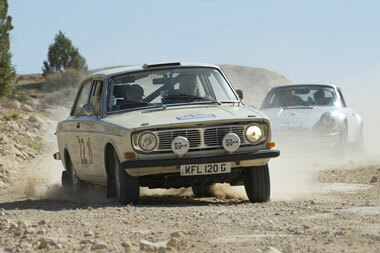 Onwards; past the Canyon of the Ancients to the first regularity section at Ismay, a dry loose and sandy section with some tricky hairpins, off camber turns and sheer drops to the side. Car 10 the Aurebachs’ Chrysler New Yorker put in an 'entertaining' effort while car 22 the de Souzas’ Volvo ended up with a maximum time penalty. Overall this regularity put a smile on many a face and somewhere after this we slipped quietly into Utah. Then, only 12 miles down the road was test 2. More of the same, desert track with sand but this time some of the crews weren't smiling. A tricky regularity caught them out with only car 22, David and Jo' Roberts achieving a clean sheet. So, with the competition out of the way we made our way to lunch at Monument Valley the eighth wonder of the world and the MTC. 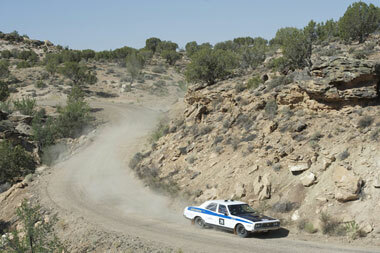 There were some fantastic views on the way with Moki Dugway taking top honours here. After a tarmac climb over the plateau we were treated to a gravel hairpin descent with views bigger than big and wider than wide. We could see Monument Valley approaching for around 20 miles. South on route 163 to the Mexican Hat fuel station which was a hive of activity as cars were filled with gas and windscreens cleared of bugs. As usual we attracted a lot of attention and one 'oldtimer' remarked "You guys look like you're having too much fun". How right he was. Then we ran into Monument Valley itself with the buttes and towers rising from the sand and shimmering through the heat haze. There were clouds but they were more window dressing and did little to shield us from the burning sun as the mercury rose above 30°C. The final MTC of the day was here so the afternoon was free for crews to explore the area, the heart of Navajo Indian territory. In this spirit of exploration, we took in part of the 17 mile drive through the valley on a rough and sandy dirt road and wondered where does that $5.00 entry fee go? 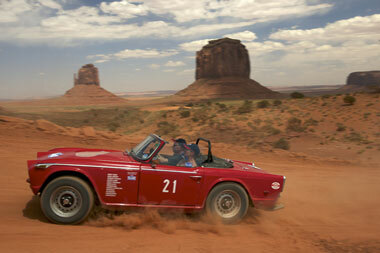 We saw cars 21, David and Jo Roberts & 22 Jose and Maria became the first classics to compete in the first hill climb at Monument Valley. They finished in first and second place respectively although needed several attempts to get up. So much for a bit of playtime but we still had to get to the night halt in Page Arizona, some 123 miles further along the road. The views of the monuments in the rear view mirror were better thanks to the shifting sun than they had been on the approach and we even passed a lineman, a long way from Witchita though. Our night halt of Page was only founded in 1957 so it's quite a spring chicken...... Which brings me on to some birthday greetings for the evergreen, 80 years old, Gerry Crown, and for once on an event he’s not the oldest participant. Many happy returns Gerry. Tomorrow is a rest day and many of us will be boating on the beautiful Lake Powell or taking a drive to the Grand Canyon, or fixing cars. As I write Andy Actman is once more letting rip in the bar. Jimmy Hendrix eat your heart out.